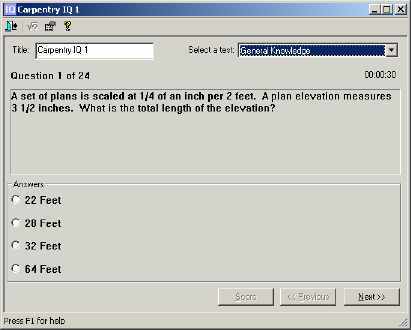 The Carpentry IQ tool is an assessment tool used to evaluate ones knowledge on a given subject. A general carpentry test is provided with the tool. You can write your own tests with a simple text editor. Tests will automatically be loaded and scored by Carpentry IQ.